We have no press agent, we normally avoid publicity and editorial requests, and we have enough to do just keeping up with all of our client demand and orders for our work, and constantly building our human organization, skills, research and extreme hand technologies to stay ahead in the race for innovation and excellence at the Paris avant-garde collections level. As such, we have no press samples, and when media people and stylists ask us to "loan" our Paris prototypes for fashion shoots we always respectfully decline. 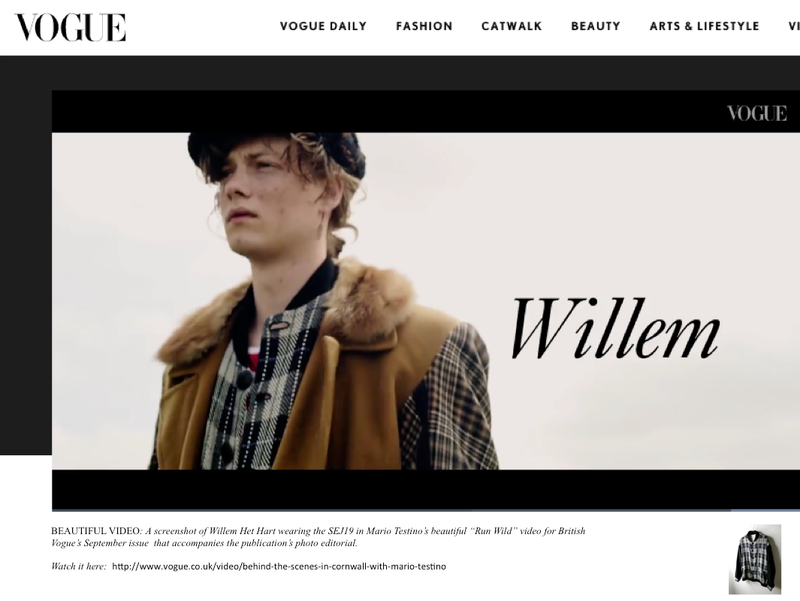 But last May, when Katie Dufort, the impeccable Assistant to the Creative Director at British Vogue contacted us for a shoot that was being planned by Mario Testino and Lucinda Chambers (Creative Director at British Vogue) for the September 2017 issue, and we realized the people contacting us were real, and were really serious about the project and pieces from our 'secrets' AW17 Paris collection, we decided take a risk and make an exception. 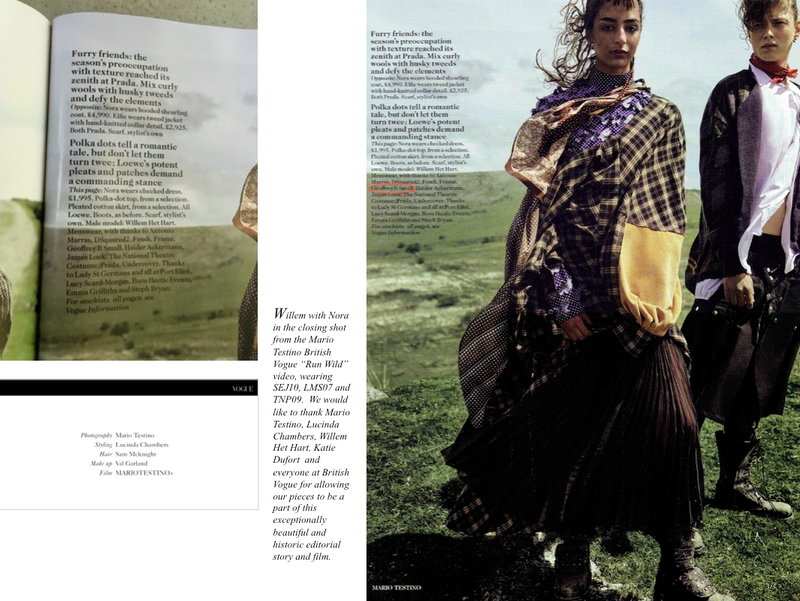 At great expense and risk (we were already in production for AW17 and needed the prototypes for the production samples), we sent our prototypes to Vogue House in London where they were to be taken out into the fields of Cornwall and shot by Mario Testino for what we felt might be a major editorial. Big changes were going down at British Vogue. In April, news hit that Editor in Chief Alexandra Shulman was out, and Edward Enninful, the first black editor-in-chief in the history of Conde Nast, was coming in from W in September. 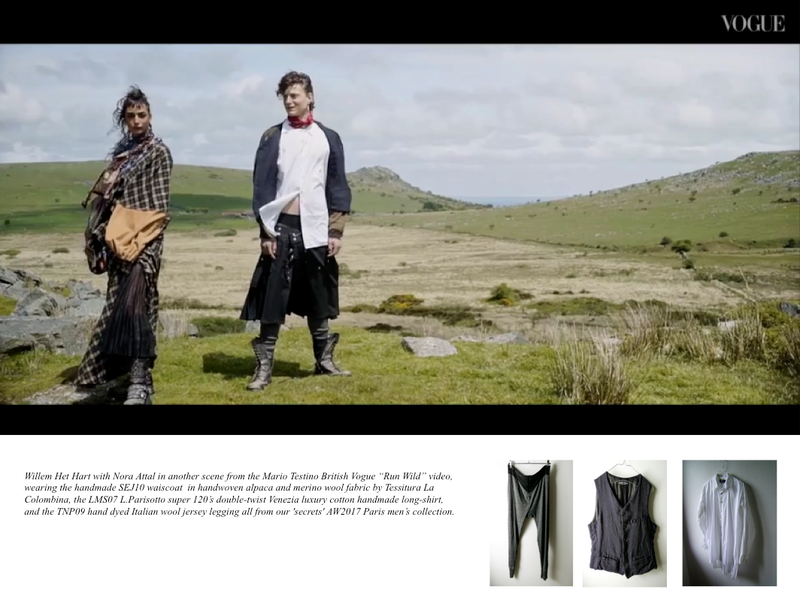 The prototype pieces all came back a week later without too much of a hitch, we were told the shoot well, our clothes were used in it, and we thanked Katie and the Vogue UK staff profusely for not losing or damaging any of the prototypes. 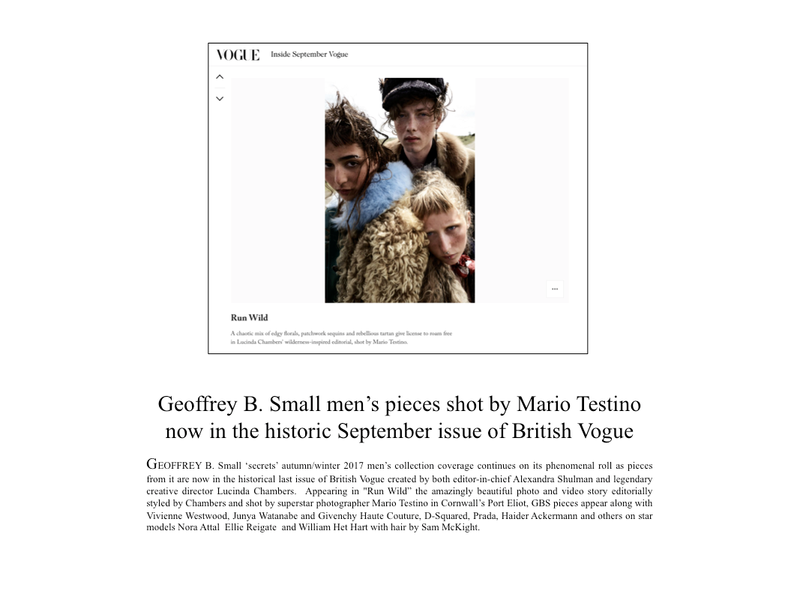 Geoffrey, congratulations on the British Vogue spread! A big thank you to SZ, Atelier NY and everyone who came by for last Friday's event in New York. (Causeway Bay 2/F Hyde Park Mansion, 53 Paterson St, 1pm - midnight tel 28082381). come to symbolize a world spinning out of control? And what does that have anything to do with fashion these days? IN our ongoing commitment to human performance, artistic expression, and the environmental catastrophe we now all face due to the failure of a ruling class so out of touch with the reality of our humanity, that they are now racing to eliminate it, including a fashion and textile industry which has recently been exposed to have already contaminated virtually all of the world's public drinking and sea water with plastic microfibre particles from its massive use of polyester and synthetic materials… "Come and Go" will introduce the first live theatre performance ever done for a Paris fashion runway presentation, as well as the most advanced extreme handmade clothing technologies and concepts for women from our world-renowned via Spalato workrooms at Cavarzere Venezia, all enhanced with an amazing master performance based upon the play by Samuel Beckett directed by Brad C. Sisk starring Sara Lazzaro, Melissa Purnell, and Jenni Lea-Jones. We believe it will be a revolutionarily human, emotional and touching event during the fashion week, and we truly hope that some of you reading this can be there. revolutionarily human, emotional and touching event during the fashion week. So why merge live theatre with a Paris defile? THERE are many reasons far too many to list, but perhaps the best one may be because we are living in a world where the very existence of our species is now being put to question. The very hopelessness that Beckett came to define is now a real phenomenon among the vast majority of human beings. It is becoming a part of our existence. We humans can't seem to do anything about anything anymore. Fabled democracies are no longer democracies at all. Our vote. Our civil liberties. Our so-called human rights, are nothing but a memory, or worse, a lie and a delusion. Our lives, planet, and destinies are being manipulated and controlled by a ruling class that is committed to perpetual war, contamination of our environment, slavery and human misery, unprecedented deception, chaos and division, and the premise that they can escape and protect themselves from the calamity that their actions and leadership are driving us all into. Hell on earth is coming for us. But not them. They will continue to survive and prosper, the rest of us are expendable. A nuclear war or confrontation is now on the table and in the open discussion of the mass media of the world. The world's most powerful economy and military power is now a mutually dependent single-bonded entity feeding on itself and everything else around it in its constant need to grow ever more larger with no end in sight. Mounting and ever-more shocking examples of nature's immense power to destroy all of us and reshape the entire planet as we know it are taking place everyday along with the mounting millions of human victims as result. From the plastic contamination of all of the world's water, to the melting of the world's permafrost releasing oceans of methane into the air, and glaciers and arctic ice deepening the warming of the oceans and raising them at the same time, to the apocalyptic droughts and massive forest fires turning carbon sinks into carbon sources, to those bigger and bigger storms- one after the other- hitting us everywhere and releasing mountains of chemical and radioactive contaminants as they begin to smash our feeble and hastily designed infrastructure- which is now based so foolishly on all these toxins, and the hundreds and hundreds of species now going into extinction as biospheres and systems get increasingly messed up from all these massive changes… the world is changing right before our very eyes. We were warned about this. We are all concerned about this. But our leaders and those who control the strings of our civilization, and have known where things have been going to, have done nothing- except get in the way at every step of the process. What have they done? They have used their media from television to the internet to smart phones to confuse us, scare us, and divert our attention to a threat and an enemy that is always changing but is never them. They are investing unprecedented resources to be able to live without us, and if necessary to defend themselves against us, even eliminate us, once we really realize what has been going down all along. Throughout the entire western world now, local police are now armed to the teeth and national armies are being prepared for domestic deployments against their own countrymen, but the madness doesn't stop there. The end of mass employment is now on the very near horizon as Artificial Intelligence (A/I) is being rolled out into our societies at a breathtaking pace and the perpetrators of these technologies are knowingly aware of the appalling results to humanity that will result from it that will shake our civilization to its very core as a result. Between mass unemployment, mass dislocation from global warming disasters and the next perpetual war that comes to a neighborhood near you, the world will continue to spin into ever unbelievable chaos and misery… and those who are causing it and profiting from it, will need increasingly armed force to protect them from their own citizens who they have abandoned and abused so much. SAMUEL Beckett was one of the great avant-gardists of the 20th century, like most of us in our game, he had to go to Paris to make it in his game as well. And while he was perhaps one of the most influential writers during his lifetime, like Orwell, it is today in 2017, where his bleak, minimalist, views of human existence, helplessness and inability to change destiny from destitution is now becoming the reality and the future for most of the human world. The inability to control the world, let alone survive in it anymore, its ominous future, and the growing focus on poverty, failure, exile and loss- as Beckett put it, on man as a 'non-knower' and as a 'non-can-er is becoming more and more prescient. The systematic extinction of democracy, freedom of the press, expression, movement, civil and economic liberties, any form of security and safety, and even privacy, grows unabated everywhere. The bombardment of images of police abuse, refugees, terrorist attacks, and increasingly bizarre and insane leaders spouting off at the mouth continues to reinforce the idea that the individual normal person is being increasingly left out on his own with nobody to depend upon, especially those who have been entrusted with the responsibilities of keeping the public safe, secure and better-off with them than without them. And when it comes to a global fashion and textile industry that has singlehandedly contaminated the entire world's drinking and sea water with plastic petrochemical micro-toxins, kept a 6th of the world's population working in slavery, stolen another 6th of the population's money and jobs by selling them garbage made of plastics at all price points to the rafters, and brainwashed generations of humans into merrily going along and paying their money for this road to hell… there is clearly a lot to answer for. 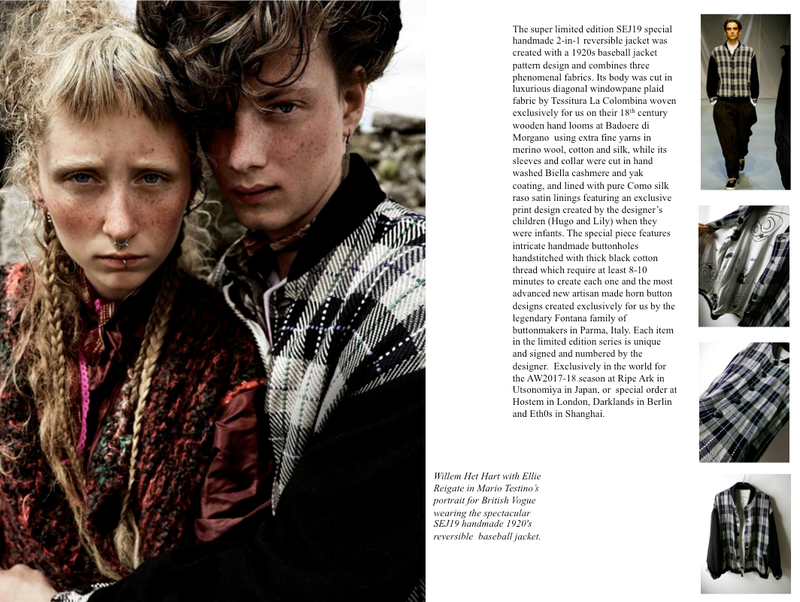 As fashion mirrors the society in which it finds itself in, Beckett's non-knowers and non can-ers know no end. Indeed, today, they are everywhere. "Come and Go" has been called Beckett's most perfect play. A masterpiece of his pioneering minimalist style, it is said that he agonized over each individual line until they perfectly hit a vision he had in his mind. A vision that portrays a story of time, human relations, and some calamitous event, or perhaps many. Beckett knew how transient everything was becoming. And isn't that what fashion is? Everything truly is so "come and go" these days... especially in this digital and virtual age of fakery and vapidity. But like the new GBS limited edition collection showing with it, the play is an essentialist work based on real skill and truth. Only exactly what needs to be there is in it. No more no less. And therein lies its beauty and power. So little can indeed evoke so much. Last edited by Geoffrey B. Small; 09-24-2017 at 04:30 PM. Brad Sisk has been inspiring and driving pivotal live performances behind our past three Paris campaign presentations (Secrets, Grow Deep and 100) which have pushed our use of live performance of opera and classical music in our shows to new levels. This time, he will direct the first theatrical play presentation ever done in a Paris defile. What's different with this rendition of the work is that it's all based on craftsmanship, acting craftsmanship-- inspired by Japanese Noh theatre, but not copying it- instead coming from his new group's western acting foundations and gradually finding a way into the play's own truth within. The result is a revolutionary new stylization of a theatrical piece of hyper-essentialist quality… which for people that go to GBS for exceptional craft and technique, has that element in the show itself. Mirroring Beckett's hyper-essentialist play, the accompanying GBS collection for women will be based on our most advanced, extreme and concentrated craftmanship. Here previewed from the new collection, the hand dyed Tessitura La Colombina's latest handwoven cotton wool fabric masterpiece, combines with Ezio Ghiringhelli's pacman jacquard weave lining cloth all superbly bound finished with an exquisite jacquard weave cloth binding tape made exclusively for us near Milan. LIKE our world-class tailoring and design team, Sisk has meticulously assembled a cast of serious acting masters for this special historic fashion presentation after having seen each of the 3 actress's work then having extensive discussions about their approaches to craft and technique., Sara Lazzaro, cast member of HBO/Canal's The Young Pope TV series and the star of SKY's "The Young Messiah" comes from the Meisner school of acting. Jenni Lea Jones comes from the classically trained Shakespearean British acting school another technique which adds a different dimension, and Melissa Purnell, fantastic opera singer who is Stanislovsky-trained comes from the opera world -- so for her, performance is all about craft and technique. Sisk purposefully combined the three distinct approaches to make them create three stylized nuances despite the repetitive nature of the script as written by Beckett. The result will be a radically new way to do Beckett and to do theatre. And it will create a new experience and version of the play that is very sensitive to how Beckett is alive to these traditions. Beckett knew theatre very intimately and he was inspired by it. For example, the hats and faces in shadows of 'come and go' relate to the masks of the ancient Noh, the way they walk and move as well, and how he takes these great traditions of human acting and performance based on centuries and generations of culture and skills, and made them something new and avant-garde for the 20th century is identical to what we are doing in our design work with clothing today. For that reason, we will combine live theatre with a collection presentation in Paris next Saturday for the very first time in the history of both métiers. And in total defiance, we will spit in the face of artificial intelligence, e-commerce, automation, plastics, slavery, de-skilling, de-humanization, unsustainability and this approach to fashion in all of its ugly forms. new GBS "come and go" women's collection now being completed in our workrooms. BECAUSE unlike the Amazoner cricca's view and approach… we believe in the human being. We believe in the soul. We believe in beauty. And so for years, our expression on Paris runway has been about the human emotion and the human experience as the priority above all else. Chanel's rocket-ships or Rick's brutalist enormism spaces are big-spending spectacles that certainly carve out pieces in the fashion show circus viewers mind, but we are taking a different route- focusing on the inner person, the human emotion, the truth and the heart, as being equally memorable, and valid. 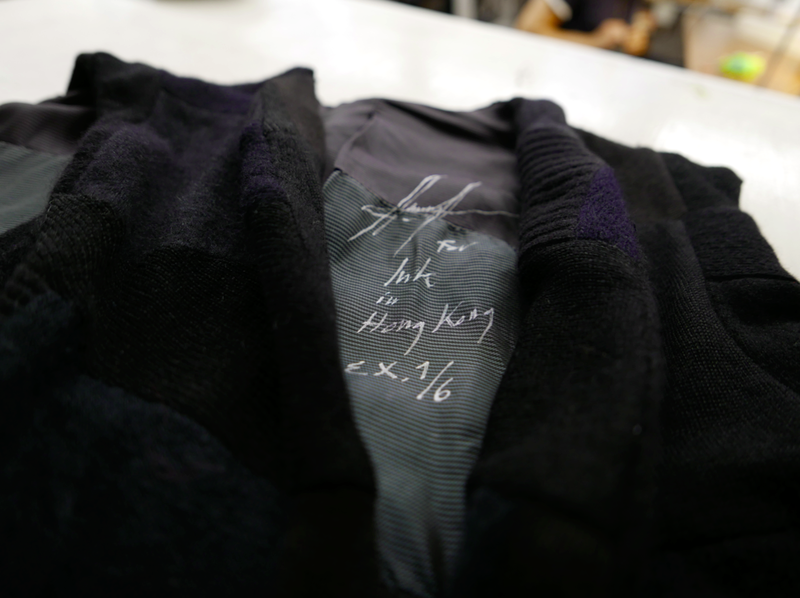 It mirrors the kind of clothes we create and the vibe that goes through each and every one of our pieces. Those who own and know our clothes may understand what I am talking about. It is a connection of spirit and trust and service to each other. It is the foundation of how our species built its civilization over the past 10,000 years. And it is going to be the only thing that will have even a prayer of saving our race from what is coming in- the short few years ahead. Human being to human being. Reaching out to each other. And working together and doing whatever it takes to solve the problems and challenges that now threaten our very survival and future on this planet. "Can we not hold hands like we used to do" is the line in Beckett's play. In fact, we must do exactly that if we are going to go on at all. The phrase "come and go" intimates a temporary presence in a physical place. How long that temporary presence lasts now depends on us. 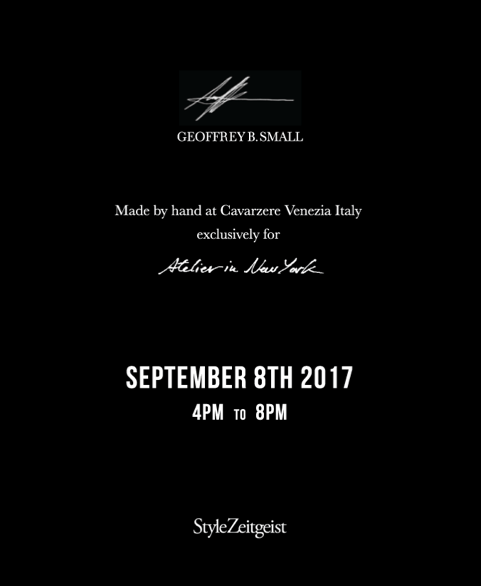 the new collection being presented in Paris on Saturday. A very special and historic presentation that combines fashion and theatre for the first time on a Paris runway will focus on the masterful skills, passion and excellence of everyone who has been involved in this extremely ambitious and yes, risky endeavor of art, craft and expression. An essentialist performance of a theatrical masterpiece dressed and surrounded by a masterpiece women's collection that is equally essentialist in its beauty, clarity and undeniable quality. On Saturday night, fashion will truly become theatre, and theatre will become fashion, and a new form of the Art will be born... dedicated to the power of human beings to work together with passion and begin to turn the world around. We hope to see some you there and share this historic experience and artistic moment together. at Cavarzere, Venezia in Italy. 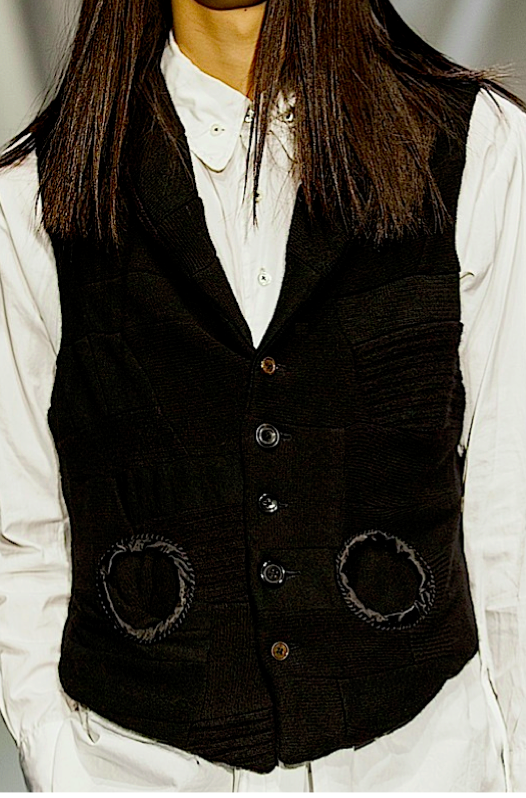 I absolutely adore that circular pocket knit piece! 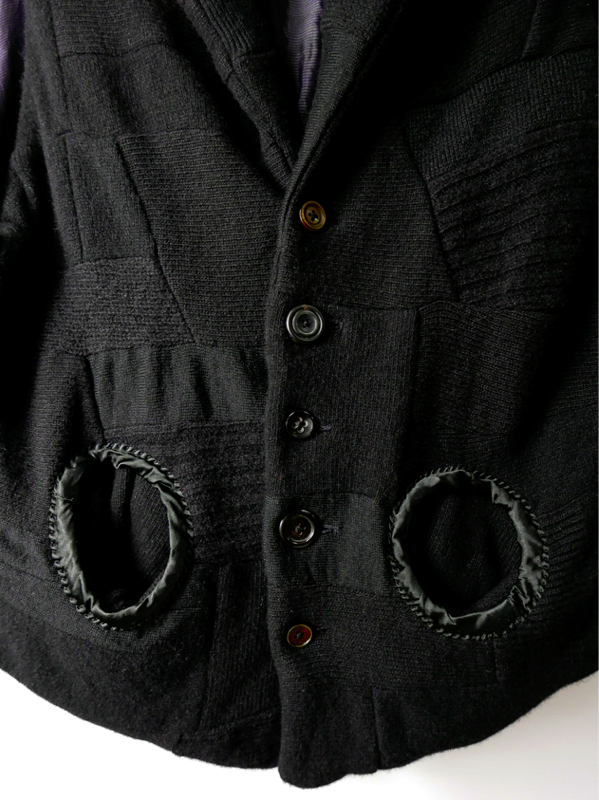 Its intriguing to see how Geoffrey B Small pieces evolve,,,I have the recycled knit circular cardigan piece and can see how it is used as a Lego block to build this new SEK06 piece. All the inventions and methods that he creates are stocked up in Geoffrey's tool box and you never know when it will be combined with something else to create something completely new. 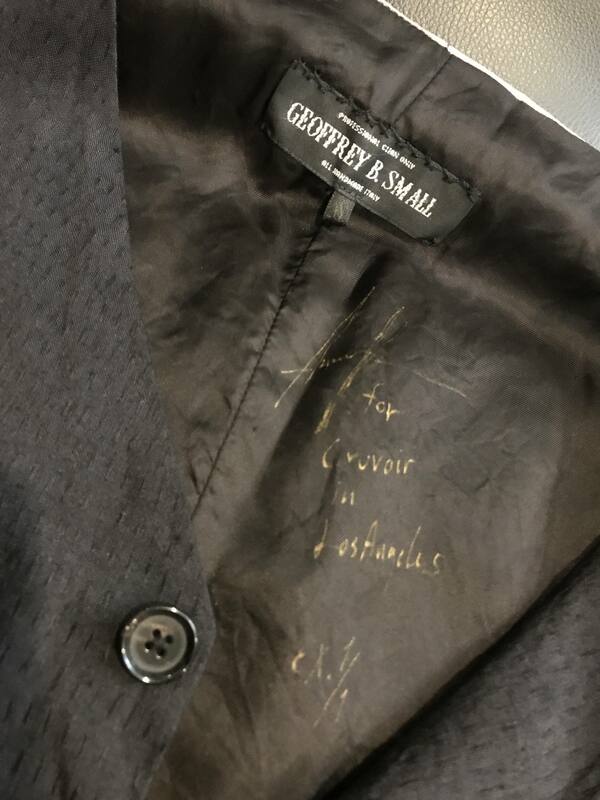 Every collection, every year, every garment trying to do something new, something better...Like a top tier athlete trying to battle against himself....Honestly I dont (and Can not be obviously) want to be Geoffrey B Small,,,its too much hard work and no time to rest (LOL). WITH many thanks we present the superb video documentation by Kris Dionisio and Luca Bragagnolo of our historic Paris presentation last month in Paris which combined a live theater performance of Samuel Beckett's "Come and Go" with a full defile runway show of the new GBS spring/summer 2018 women's collection under the same name. The concept of theater/defile is a first in Paris runway and part of our ongoing commitment to human skill and artistic mastery in a corporate-driven world hell-bent on eliminating both of them. Both the mesmerizing performances by Sara Lazzaro, Melissa Purnell and Jenni Lea-Jones directed by Brad Sisk; and the impeccably elegant new collection for women with its cutting-edge extreme handmade and sustainable design technologies created in collaboration with our legendary GBS key supplier world-class partners including Fratelli Piacenza 1733 SpA, Luigi Parisotto, Tessitura La Colombina and Botonificio Fontana Srl, eschewed the meaningless throw-away atmosphere of vapid celebrity and fake-designer streetwear that continued to dominate fashion week in Paris this season. We continue to be both entertained and appalled at the increasing lack of skill, technical capability, and poorer and poorer quality materials that our 'genius' colleagues are perpetually "styling" into runway looks that may convince a new generation of uninformed customers who do not know (nor have seen) anything better-- that such slapdash work and crockery is indeed "designer creativity" and of a quality that merits their respect and their purchases with their money. What a funny joke (as SZ's Eugene Rabkin elegantly referred to recently in High Snobiety). And what a foolish market the industry now works in these days. We ask all women to view all the collections this season and then ask themselves honestly--"what would I wear and more importantly what would I buy?" In response to those two fundamental questions, that yes, also pertain directly to the Paris avant-garde and those supposedly responsible for leadership creativity- we set out to do something truly avant-garde these days in fashion… propose and create real clothes for real women with real lives and real responsibilities. The best of the best for those who seek it, from materials, to craftsmanship, to fit, to longevity of wear, to an elegance, style and taste that befits a certain level of culture, society and living far away from the maddening crowd of the fashion business brainwashed world of, for lack of a better or kinder word, idiots. 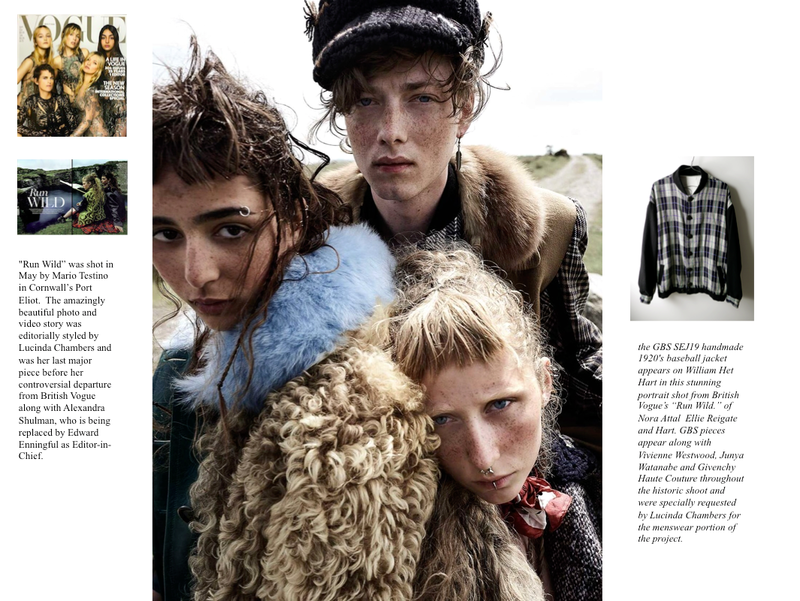 A good look at women's clothes offerings today is a pathetic display of industrial misogyny. Forget Trump and all the others in the abuse-of-women news these days. Look at women's clothing. Clearly, from designers to brands to the retailers that continue to carry them, nobody is taking care of the customer. Especially if she is serious, busy, working, wealthy and even dare say, powerful-- everything is over-priced and its value so poor for money paid-- and well, are we really going to deal with our business strapped up in t-shirt pieces and puffy things looking like we are wearing diapers, or patchworked up in a manner that neither displays quality or skills, or evern better, all wrapped up in carcinogenic synthetic polyester, polyethylene, polystyrol and plastics in any choice of creative form as long as it is petrochemical-based and chock full of dioxins like 99.9 percent of all new clothing in the market (and on the runways) today? And as the corporate-driven fake 1990's revival of streetwear continues to rip-off both customer and society as a last ditch stand by the industry to continue to get away with unsustainable and unethical production and practices under yet another new version of the emperor's new clothes (a term also used by Eugene Rabkin in the same High Snobiety interview)-- one must ask... "do you want to look like this? and do you also want to suffocate and immerse your body in it- to feel it on your skin 24 hours a day?" Mind you for a good bucket-load of your money to pay for the 'privilege' as well? We don't. We don't need to be dictated to by the mass fashion media and its corporate-backed keepers. Look at their involvement: Kering and LVMH have eaten up this trend-- and more ominously, even Carlyle Group is now buying Supreme. Helloooooo... does anybody out there know who and what Carlyle Group is? Look it up. These are the people who brought you the Iraqi war because they "knew" Saddam Hussein had all those WMD (weapons of mass destruction) that never really existed. These are some of the biggest liars in the history of the United States. You want to give them your money by buying Supreme's fake limited editions (which aren't even numbered)? The Carlyle people have so much money they are laughing their butts off at you. While you are hurrying to buy that new plastic sneaker before it "sells out," they are busy taking your money and making even more by investing in nice productive and healthy things like war, fossil fuels, artificial intelligence, automation and globalized corporation-run government that will soon render you jobless, homeless, country-less and even just-lucky-to-be-alive-less in the years ahead. Go ahead. Give them your "hard-earned" money while you still have it. We are living today in a massive fool's market, and billions can be made at the expense of a world full of idiots. Uninformed, trend-dependent, and gripped by their smartphones and the garbage being fed into their brains from their mobile devices and the people behind them, these consumers are spending like the sailor with no tomorrow, and sometime soon, may very well find they have nothing left as a result. No job. No house. No money. And after wasting so much of that money on bad clothes- No clothes, either. We seek to support, cultivate and serve a different customer. The ones that still have a brain of their own. A survivor in the years ahead. Able to see what's coming, and to determine real value for money spent. A breed apart from the growing crowd of foolery and madness. Who understands that we are now dealing with life in the late 2010's, not the early 1990's. A student perhaps, an admirer for sure, of human history, culture, craft, technology, nature and everything our species has of value as it faces its own total extinction, or we hope, miraculous change in behavior and potential survival in this ominous and tumultuous century we are now living in. It all comes down to the human being today and how well we can work together to survive our own self-destructive behavior and stop it. You gonna be another dumb sucker for the corporations? Or a survivor? We're puting our money on the survivor. That unique human being that won't give in, give up, or be manipulated by the corporate crapdom being pumped out of everybody's screens these days. That thinks on his or her own, and exemplifies excellence and integrity-- and yes, class, and brains, in everything he or she does. So it's Beckett with our clothes. It's total silence in presentation instead of any music, live or recorded. It's total perfection in choreography, dialogue, and performance--all done live by real human beings who are rare masters at their art and their craft. That is our statement. The federation (dominated for the past two decades by corporate luxury groups) once again refused to recognize us on their calendar and the mainstream fashion press equally ignored us. We don't care really (that is another story for another day). They like it, they don't like it. That's not our issue. Our job was to create it and do it. Before anyone else. And this time in Paris, once again, we did. With a thousand thanks to everyone who contributed to this effort and who has helped us to get this far. 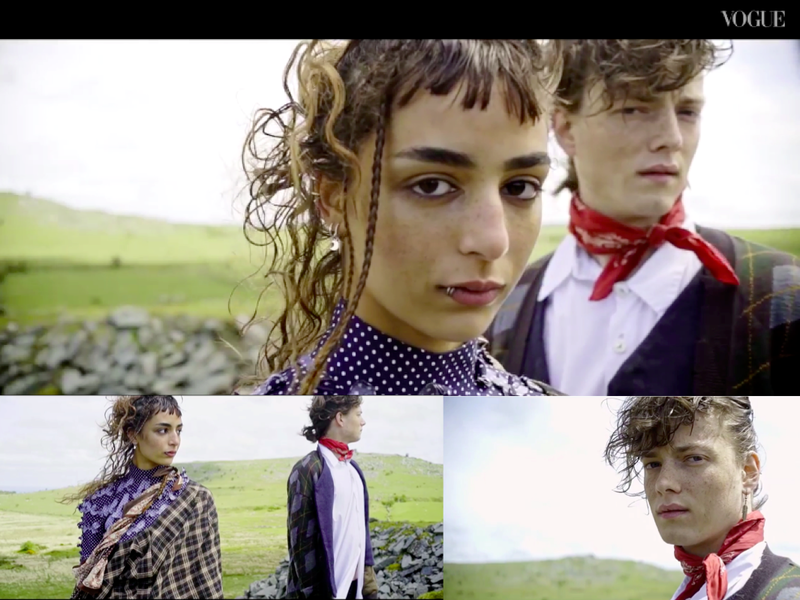 Barbagelata and Dario Ruggiero at the seasonal collections GBS SS18 Women's thread here. Hi, Mr. Small, great pictures and I loved watching the "come and go" show you posted above! I have been trying to read the whole thread and I'm only half way done yet. Very informative to me, and I believe everyone else who's never worked in the industry. I admire your belief in human being and your commitment in staying independent. I don't have a big budget on clothing as a film student but I believe I'll purchase more of your garments whenever possible. I have a small question and would appreciate it if anybody can answer it... I'm not sure if it's the right place to ask this question though. 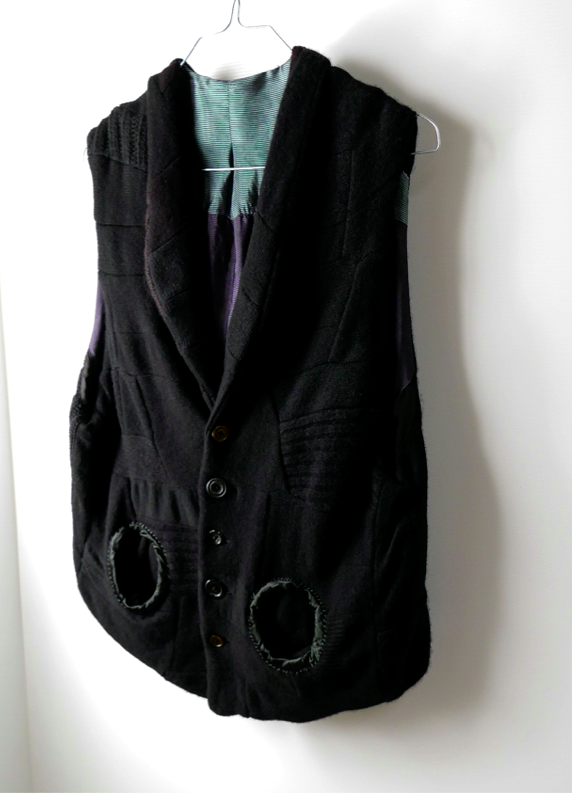 Recently I purchased a STJ08 waistcoat in silk and linen. I absolutely loved it once I laid my hands on it and planning to keep it forever. 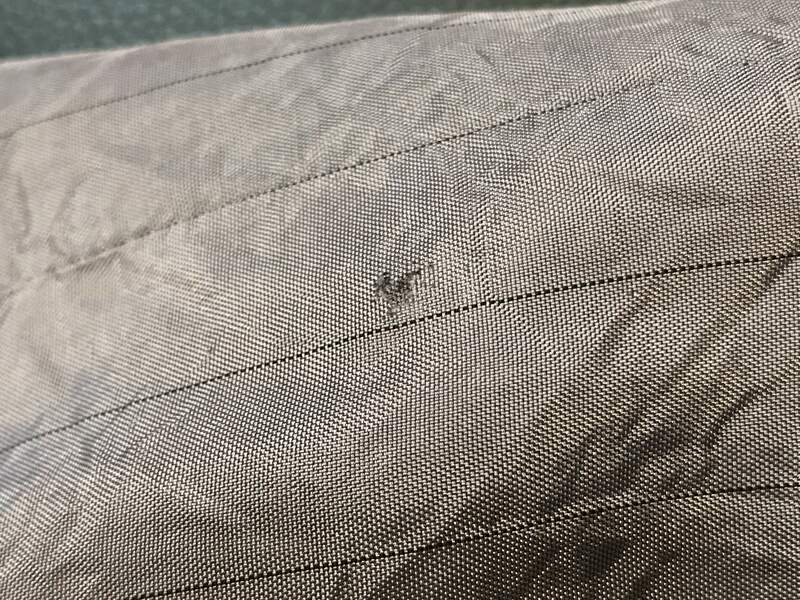 However upon closer inspection I found a small torn area on the back side of the waistcoat... I have attached a picture of it (it's a small tear) Does anyone know if it's repairable? Thanks in advance for any help and have a good one everybody! Last edited by WilliamZHL; 11-04-2017 at 09:25 PM. Please also advise how, when and where you purchased the piece so we can check if any of our warranties apply. Our in-house alteration and repair services will be glad to review and inform you what options/remedies might be possible from there. Hope this is helpful, we look forward to hearing from you. I will send a email to the address you posted above. Thank you very much for your reply, I appreciate it! Sorry I wasn't familiar with the 3rd party image hosting system... Hope now it's fixed. I bought it from cruvoir in Los Angeles via e-mail about 10 days ago... I will send a email to the address you posted above.Thank you very much for your reply, I appreciate it! Thank you for your information and the images which are now well visible. We need to make clear that Cruvoir is not currently an active authorized dealer for our work. Their GBS dealership authorization was terminated beyond SS2016 collection pieces and we are a little bit concerned about the nature of the sale to you. We would like to discuss the history of the sale further but not on the forum, so please do proceed to contact us directly at the the email address above (and below) so we can see what can be done to help you as much as possible. You are also welcome to provide us with an email we can reach you at directly from our workrooms in Italy. Thank you very much. I wasn't aware that one can buy GBS online now. Love that, since there is no GBS dealer around were I live. Which other stores sell GBS online? In your particular case, if you are in Germany there is Darklands in Berlin, we are sure they will be glad to assist you when you are ready. Hope this is helpful. Last edited by Geoffrey B. Small; 11-06-2017 at 09:46 AM. I think they have had bad experiences with customers in the past via email correspondence so they have now chosen to suspend or neglect email purchases. If you send an item back and request a refund they have a strict policy whereby the customer would be suspended from future email correspondence until the next season. It would be best to actually visit the store. Last edited by Mojo1990; 11-06-2017 at 02:27 PM. I realized some Japanese fashion designers like Rei Kawakubo or Issey Miyake really love to use synthetic fabrics like polyester. I know Mr. Samll is strongly against using synthetic materials. I'm just curious that why those highly regarded deisngers choose to use a lot of polyester? Is it because of the cost (unlikely for the price they are selling for)? Or there're advantages of polyester that natural fabrics don't have? 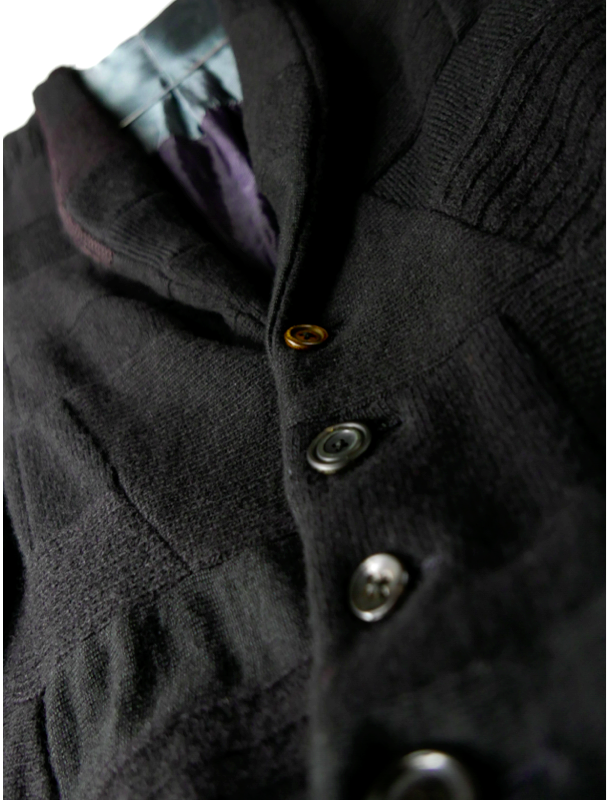 I've heard that years of research made synthetic materials today much better quality and less pollutive, is that true? I personally would prefer what GBS is doing but just curious about those questions, and would love to learn more about it. Anybody who can share some knowledge would be appreciated! Well, you'd have to ask them, wouldn't you? I know Rei likes polyester because she's a contrarian about fabrics. On the flipside, CDG does not use leather, except for shoes (or maybe not at all come to think of it?). I think Issey uses poly because of it has the properties he needs to achieve the effect that he wants. For example, I don't think you can get Pleats Please or Homme Plisse with natural fibers. The material just doesn't behave that way. 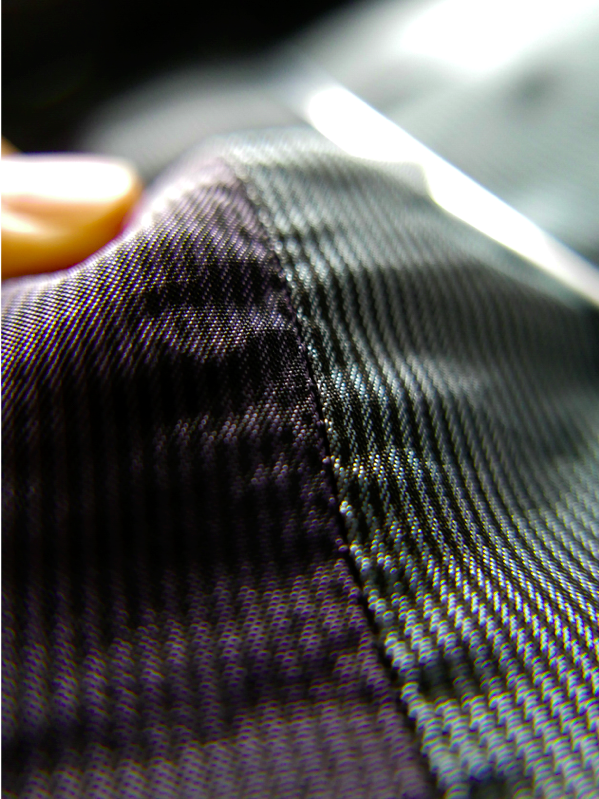 For pleating, you typically need to use a fabric that has something around a minimum of 45% poly or else they might come undone and will have to be reset. However, decades old Mariano Fortuny silk pleats still hold today so it also might have do with our modern techniques that affects our current state of pleats. Issey also uses machine pleating as far as I know for his Pleats Please so this also might be why poly is necessary as this method probably destroys delicate silks. Perhaps Geoffrey has more insight into this. CDG definitely sometimes does their bags in leather (unless they've stopped?) but will alternate from season to season from pleather to leather as far as I've seen. CDG wallets are made of leather.